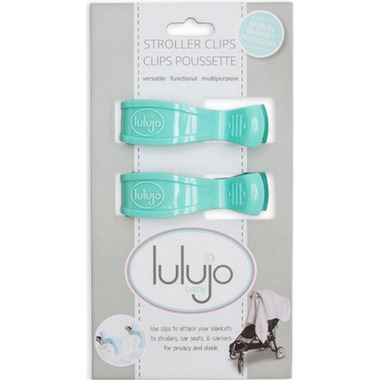 Turn your beautiful Lulujo Baby muslin wraps into a stroller cover or car seat cover with these chic stroller clips. This must-have accessory is an easy way to provide privacy and shade to your child as you travel around. The simple claw design opens wide to fit any stroller/car seat handle and has a firm but gentle grip to keep blanket in place. Includes 2 clips. So useful! Keeps baby from throwing the blanket off every 10 seconds, and keeps the winter bag in place when I put the stroller in the trunk. Great for a windy day! Very good grip to use on car seat or stroller to hold toys. Very pretty colour. 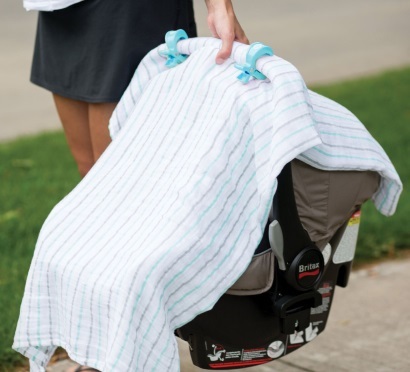 This works great to clip a blanket over the front of my stroller to protect my son from the sun when it is too bright or when the canopy of the stroller does not cover enough.